Most people are familiar with “brain freeze“, that incredibly painful headache which occurs after ingesting ice cream or some other very cold foodstuff or beverage. The frequent and sharp cold snaps in this area are causing brain freeze of a different kind. People get headaches when they see the upcoming weather forecasts, or hear the incessant grumbling about the cold, and then their brains “freeze” or go numb to better cope. Cabin fever is nearly at pandemic levels. Some of the luckier souls booked flights to warmer areas. Those left to brave the arctic blasts piled on extra clothes and extra portions at meal time. It gets cold in the upper Midwest during winter. Minnesota does not have a monopoly on mind-boggling and face-numbing wind chills, but for the past week, most of the coldest air keeps finding its way here. The East Coast is getting the brunt of the snow, but we’re taking on the cold. For example, Lucy’s hometown of Embarrass registered -41°F yesterday morning. About an hour later, Cotton reported -42°F. Those readings were air temperature, not wind chill. When it gets that cold, a barely perceptible breeze creates about ten extra degrees of wind chill cooling. Some species, most famously bears, hibernate when it gets cold, but not all creatures have that luxury. Even though it was -12°F yesterday morning, a fox and a rabbit playing out the ancient saga of hunter and hunted created a ruckus audible inside the house. After a few seconds of zig zagging though the backyard and kicking up snow plumes, both parties exited the property by slipping through the three-inch gap between the gate and the gate post at full speed, though it appeared the rabbit did have a fraction of a second advantage. That meant the fox probably did not get dinner and a fur stole for its efforts. By noon the temperature rose above zero and a few squirrels ventured out looking to add to their larders. Chickadees and cardinals flitted about looking for a meal and a mate. Apparently, hunger and hormones clear brain freeze quickly. For humans, not so much: I wish I had a nickel for every time I saw someone dressed in a parka, shorts and sandals yesterday afternoon. Most of the sightings were near the University of Minnesota campus, which is probably not the best advertising for its undergraduate and graduate education programs. Acts of defiance are effective only with proper forethought and belief conviction. Risking frostbite while auditioning for the Darwin Awards while hoping it goes viral on the social medium du jour merely proves cognitive dissonance. If the number of vehicles dropping through the ice on lakes statewide is any indication, spring is on its way. The days are getting longer, the intense cold snaps are not lasting as long, and baseball spring training games start in under two weeks. Hope springs eternal, if you will pardon my pun. My management training included hearing the truism “hope is not a strategy” ad nauseam, but hope provides the starting point for a strategy. Hope is the engine that inspires a person to set a goal and devise a plan to achieve that goal. If one’s hopes pin on winning the lottery, one must first buy a ticket. Hope for the best, plan for the worst, and the result will always be somewhere in between. Stay warm if your area is in the deep freeze. Good luck and be careful while clearing snow if your area is getting buried. No matter where you are, give your special someone an extra-long hug and enjoy the warmth. It helps thaw brain freeze faster than wearing a parka and shorts. A Roman writer named Vegetius wrote a book called “The Epitome of Military Science” about 1,600 years ago. One line in the book became quoted widely, although it eventually shortened to “Si vis pacum, para bellum” (If you want peace, prepare for war). The Twin Cities metro area is preparing for spring (si vis ver), but is also preparing for winter (para hiems). January was delightfully warmer than normal with a few bitterly cold days, but February to date is chiller than average. Tanker trucks are slowly driving though the neighborhoods spraying a brine solution containing salt (sodium chloride) and calcium chloride on the mostly bare streets. Winter is half over according to the calendar, but the potential for freezing drizzle and 2″ – 4″ of snowfall has the various departments of transportation taking precautions. A sign that spring is getting closer is that baseball’s spring training season begins later this month. Pitchers and catchers report later this week. We hope for a quick end to winter. Another sign of impending spring is the over/under for vehicles falling though the ice on metro area lakes in a week is now three. Thankfully, there were no deaths or injuries reported from these incidents. Las Vegas betting establishments may have an updated betting book next week. I have a feeling the number will be at least one. Perhaps a better adage is “Hope for the best, but prepare for the worst”. Many rodents stash food just in case the winter is particularly harsh. Birds seek out high fat and oil content foods starting when the days shorten. Humans in Minnesota prepare by hauling the six different weight jackets and four different styles of boots out of storage thereby replacing the shorts, sunblock and sandals that got used on the four decent summer days we see in an average year. Jumper cables, a snow shovel and a snow scraper with brush took the place of beach towels and coolers in a vehicle trunk. Grocery stores heavily advertised ice cream treats at discounted prices while increasing prices for hot beverages and soups. Airline tickets to warmer destinations climbed higher. Thus far, the seasonal snowfall is about 40% below the 30-year average to date. After an extremely wet June which quickly took the area from moderate drought to flooding, the lack of snowfall is prompting concerns of mild drought when spring finally arrives. At this point, it does not appears the area is stocking up on sand bags to stave off potential flooding. A potential salt shortage caused by last year’s crushing snowfalls has been a non-issue this year…so far. Constructions have benefited from the lack of snow and an average number of bitterly cold days, but have also endured occasional delays to unusually strong wind. Uncertainty in weather forecasts causes preparedness problems. Road salt costs money, requires storage space, and is effective in a narrow band of temperatures. Calcium chloride is more expensive, requires storage space, but is more effective in a wider range of temperatures. Sand and gravel require storage space, work in most temperature ranges strictly for traction, but cause in increase of windshield damage claims. Given a limited budget and limited storage space, find the most optimal balance of removal methods based on information that is wrong seemingly 60% of the time. Or better yet, find a balance that can change according to conditions and get a properly working supply chain in place. Farmers plant crops, many of which are sensitive to drought, hail, too much rain or not enough sunlight. If a long-range forecast indicates a drier than average growing season for which the crops are planned and planted accordingly, but the year is wetter than expected, the farmer receives diminished yields or total crop failure impacting an entire year’s operating revenue. Creatures face a similar dilemma, albeit without a well-coiffed highly paid talking head showing “wowie” eye candy computer graphics and pointing to a chroma key screen for about three minutes. Gathering food is energy intensive and increases the risk of ending up as a food source for another creature. Too much food can rot, draw scavengers and cause bacterial and mold infestations leading to disease. Too little food means the creature risks starving or freezing to death. They do not have the luxury of easily gathering more or less food, and they definitely do not have the advantage of cooperation and a supply chain.We try to prepare as best we can, hoping for warmth and sunshine while preparing for blizzards and deadly cold. Once we lose hope, no amount of preparation will help. In addition to helping our loved ones out with provisions, we also help them with our love and support. There are always unexpected and traumatic events which arise which render plans useless: health issues, unexpected unemployment, relationship problems, loss of a loved one. It is then that one finds out how supportive family is and who are the true friends. Drawing on their love and encouragement rekindles hope, and hope creates the strength to keep moving forward. If you are fortunate enough to have a special someone in your life, take the time to give that person an extra-long hug today. There is always room in the heart for one of those, they don’t expire or decay, and they provide immeasurable strength. For those of us who do not, please try to make someone’s day brighter. Your kindness may provide the hope the recipient thought was lost. Today was Lucy’s birthday, the third that has occurred since her passing. Please take a moment to remember her and the joy she brought to our lives. She would be in the living room now trying to see where the Great Horned Owl is that is making its presence known. He Who Yells At Owls is probably sufficiently inebriated to not be screaming profanities. The weather today was typical for this time of the year, cold and blustery. 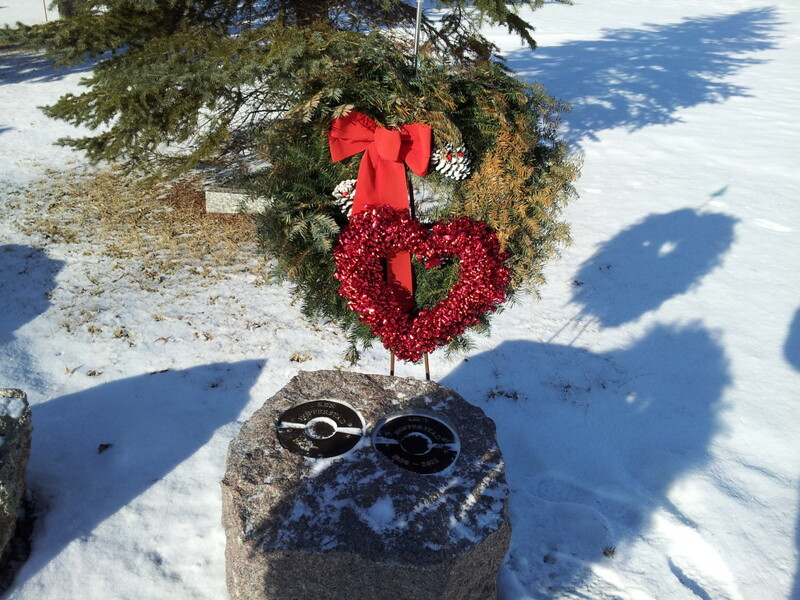 This year, the sun was out and I did not have to wade through 18″ of snow to visit her grave. Cardinals and chickadees advertised their availability through song. Winter so far has been far better behaved than last year’s debacle. Three days ago was the midpoint of winter which some places in the United States mark with a quaint rite of determining if a hoary marmot caught a glimpse of its shadow. One groundhog provided a possible etymology for the phrase “chewing his/her ear off“. People do silly things for amusement when cooped up for six weeks and some rodents take umbrage when someone reaches in and interrupts badly needed but totally wasted beauty sleep. Yesterday was World Cancer Day. Nearly all of us have known someone who is either a cancer warrior or whose cancer battle ended. We have lost too many loved ones to this horrible disease. Lucy will always be part of me, but I have to rely on memory for the warmth of her hugs and the sound of her voice. It’s not the same as having her here. Take a moment to remember those who fought and are no longer with us, and please support those who are still in the fight.